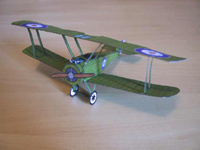 This is the miniature of a British World War I fighter biplane. See also the triplane . See the instruction pictures carefully, before assembling. Click to download the file biplano.pdf (219 Kb).